Schurr hosts South El Monte Thursday at 5:30 p.m.
*Note: This is what I have so far: Coaches, players, fans. If you are aware of any other scrimmages this week please post in comments below. 35 Comments to "Scrimmages: Below Zero Week"
More like Arroyo got ripped on every level, Frosh, JV, Varsity, I counted 1 visit to the end zone by Arroyo combined by all 3 levels. Let’s keep juicing over 7 on 7 tho. to Lol. Yes people would still be talking about it. Because when a team looks one way in the spring and then dramatically different in the summer with totally diff kids….it wasn’t b/c they wee on the baseball team! And if the ADs and admin at the respective schools would actually go out and see where people “moved” to and checked teh actual residence they supposedly moved from, there would be less transferring. But the ADs do not. So now cif has to make a call on it. Will they? Some say yay and some say nay. El Rancho dominated the line of scrimmage at both ends. Running game looked fine. The passing game will need to be addressed but overall the team looked promising. So what happened during the Arroyo and El Rancho scrimmage? I’ve seen no mention of the scrimmage. Did the Ranch get ripped? What if all these kids went to SEM ? Would you still be talking? to JBs….you are correct. They must know something or are too arrogant to think CIF is spinelss and wont do anything to them. EVERYONE KNOWS EVERY KID DIDNT JUST DECIDE TO GO THERE BECAUSE SCHURR IS A BETTER PLACE OR HIGHER EDUCATION. lol Atleast 9 kids on list of under review and or waiting on school approval. That means the schools they tried to leave are fighting it becasue they know they were influenced to go by the schurr staff. I hope the schools do the right thing and deny all of them. The kids at their own school, Schurr, should be the ones more upset. The two Buena kids, namely Gowdy was the leading rusher. 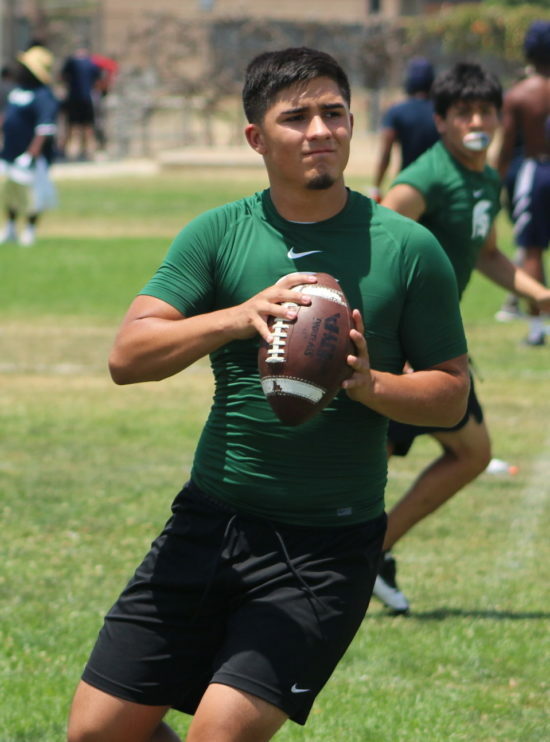 The loera kid at montebello was also the leading rusher there. Why leave if you were going to be the stud? and better yet montebello is a rival of schurr….why go to the rival? no loyalty thus the situation they are in…waiting to be cleared and I hope for one that CIF and Martinez grow a pair and see that when kids leave to a school in groups…..it’s not because they made a pact to stick together in HS. lol. There are 5 from cantwell, all offensive kids who played with the valenzuela qb and the leading tackler on the team who left there also. None of it makes since. Schurr is not the HS to step stone to college at. If those kids were that good they would move up to a better school that plays better competition. It is simply a coach et al, that is about themselves and not he kids. I hope cif drops the hammer on them and the staff! I was at the scrimmage too. SEM is down a little. Schurr has the qb, the wr/cb, the slot back and the gowdy kid. They played every down if not every down and it was pass heavy. I think the backup qb was in for 8 plays. lol the backup. They had to have run atleast 50 offensive plays. The backup was counting on being the starter this yr until the rat squad came in. @sniper, just goes to show you that like so many on here you are a fake. Get lost. Do sell your fake driver licenses some where else coach Petay. Schurr was never in the Whitmount only your head coach and Chaplin Mr. B.
OOOH AAAH SPARTAN POWER! OOOH AAAH SPARTAN POWER! @LAparent – most of the scrimmages in that area were canceled due to concerns about smoke. It’s frustrating, I was looking forward to seeing a game but it’s hard to argue with the decision. In the heat having kids sucking air that is full of crap, just not smart. @ condor, we will be ready. Should be a good game and a measuring stick for both teams. Old show down from the Whitmount days. Good luck this year and safety to both teams. Go Spartans! Why was our scrimmage cancelled. Everybody in the valley scrimmage even La Puente and we are in the same district. What’s going on at Los Altos, do we have a soft admin or did our coach did not want to scrimmage. I’ve never invested much time following Cathedral because they have always had some talent but, never do anything with it. The prior coaching staff did not have the ability to build a respectable winner, a program. Some great talent has come in and out of Cathrdral over the years. It has to be very disappointing to their fans and alumni to witness such awesome potential never realized. Is it possible things have changed on Bishops Rd with a new head coach and staff? The new Phantom staff will have to maneuver through a very, very tough schedule and handle replacing their highly touted qb, who left for Mater Dei. There is no relief for the Phantoms this season as they try to earn a playoff bid. Huge kudos to the new head coach and his staff if they can pull it off. If Angelus Fan’s update is accurate then the Phantoms could be a sleeping giant. or not. Time will tell. Schurr better be ready. We are coming! We already had one Montebello school not give us much of a look. Report from Venice High Today. The Cathedral Phantoms dominated The Highly Touted QB of Venice and Their Good recievers. The Phantoms scored on their first two possessions on the ground and scored through the air twice. The Phantoms looked good and balanced on both sides of the ball. Venice only scored once and Cathedral’s second unit. SG took care of Mt. View today, so there is still hope. Keep tabs on #87,he is a “Gronk” style player. Situation reminds me a whole lot of the situation at corona last year, 10 or so transfers came in that were all under review, CIF dropped the hammer and they all were denied and had a throw away season. Good luck tho you’re putting all your eggs in 1 basket and might get screwed royally. @ Almont League: Those are excellent questions. I’m looking forward to the season, too. @ SGV: Yeah, we play football, but I’m not sure about the timid part. And, yes, AHS got destroyed by Schurr in the final regular-season game last year, but those Spartans did that to a lot of teams. We’ll see what happens this season. I appreciate your comment, including your attempt at humor. You gave it a good try. As for the way several of the leagues in the San Gabriel Valley currently stand, I’ve been arguing for years that they should be reorganized. The CIF Southern Section has been missing in action on this issue. Interesting scrimmage at Schurr today, I wonder if the Schurr coaches know something the rest of the world does not? Every one of their 7 on 7 All Star team played today (most of the scrimmage) even though they are not cleared. Under Review/Pending School usually takes time and yet Schurr still played them the majority of the scrimmage. Also found it intriguing to see Jude sitting in the far corner of the bleachers by himself watching the scrimmage. I wonder if he is waiting to be cleared by the MUSD or they have decided he is not able to coach. Time will tell. This will be an interesting season cone league play. Have the powers shifted or have they not ? Will someone surprise the league or will the Spartans won out. Is this BG’s year ? Football season is upon us. @Oiler Nation @ RV: Both your teams play timid football as does the entire league. You fans should argue about your teams on a comedy blog. @ Local Fan: Nice pun there, and it was good of you to bring up the CIF Southern Section website. It makes for some interesting reading. If not a name, at least state which school/team you support. My name is Hugh, Hugh Mungus. Curious to see what happens, all the transfers are on CIF Website now and Under Review. Time is ticking. I really do enjoy your site TP, great work keep it up!! @ SGV: If showing common courtesy and making a concerted effort to stick to provable facts constitute “political correctness,” then I’m guilty as charged. However, I’ve always believed that to engage in politically correct talk, one has to conceal, gloss over, or ignore relevant facts. That’s not my style, but if I miss something, I’m willing to be corrected on it. We can learn from good discussions or debates. In addition, I would never make a negative comment regarding a team that Alhambra is about to play. The advice I’ve given to some of our guys is to neither underestimate or be intimidated by an opponent. Respect your opponents, but don’t fear them. Many of us adults emphasize the importance of integrity to our young people. I believe that attaching my real name to my comments sets a good example for them. It might actually enhance my credibility to some degree, and if I mess up at any time, I’ll definitely own it. I don’t know if this fits in the midvalley sports boundaries but Arleta is scrimmaging at Kennedy on Friday, 8/10 at 6:00.